Color Management Our new color management feature allows users to adjust images to their color preferences. Red, green, blue, cyan, magenta and yellow can each be adjusted individually with out affecting the color quality of other colors. Diamond Lens The 4-cluster, 13-piece all-glass lens provides excellent focusing performance with 1.5x magnification of high-definition images. 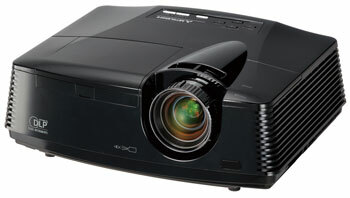 Top Access Lamp Users can replace lamp with out taking down the projector if ceiling mounted. This design simplifies lamp replacements without turning the projector around or over when mounted on the ceiling or resting on a shelf. Long Lamp Life An amazing lamp life estimated to last up to 5000hrs. Provides owner with hours of home cinema watching enjoyment. The Mitsubishi HC4000 full HD 1080p home theatre video projector provides both video enthusiasts and do-it yourselfers with an affordable full HD projector that delivers eye-popping images and action like you've never before seen in the comfort of your own home. Movies, TV programs, sports and games can be projected larger than life, with sharp, vivid colors, and great image depth for the ultimate home viewing experience. Dimensions (W x H x D) 13.6" x 5.1" x 10.6"